Fence torn down again, soccer players liberated Octagon Field. Yesterday, on a surface that looks exactly as it did when RIOC "temporarily" closed it last summer, defiant players kicked soccer balls freely at Octagon Field where a fence was torn down for the second time at least two days ago. Update: Monday morning, just two hours after posting this story, we learned about something RIOC can do with urgency and focus: close Octagon Field. Again. Before 9:00 a.m., RIOC had a crew onsite, the protective fence back in place, for now. The weather was mild, in the 50s, and a bright sun drew distinct shadows across Octagon Field late in the afternoon. 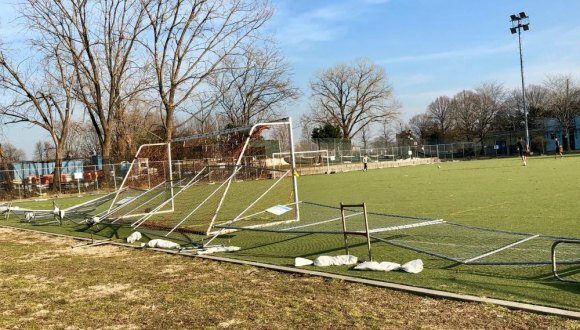 A fence erected to prevent anyone from using the field had been torn down for the second time and left resting in the grass on the west side. 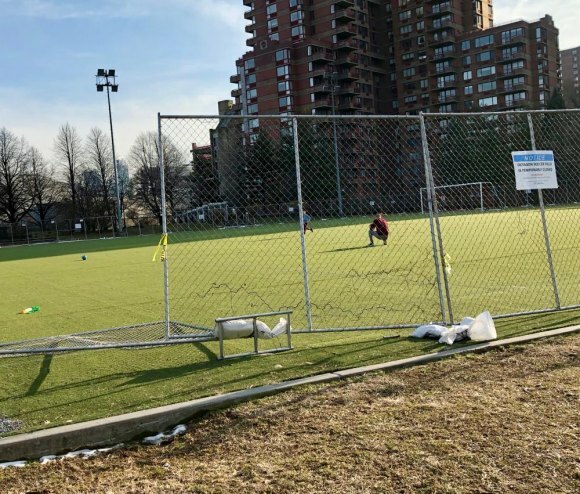 Anger has increased over RIOC's mishandled closing of the popular soccer field, aggravated by what's perceived to be a leisurely approach to repairs and indifference towards resident concerns. At a minimum, when all is said and done, Octagon Field will have been closed for a year and a half. Apart from new lighting and erecting the fence, no repair work has been observed since the closing in June. RIOC's efforts to explain an apparent lack of focus have not been well received by the community of athletes, and claims put forth by President/CEO Susan Rosenthal have been challenged as less than truthful.